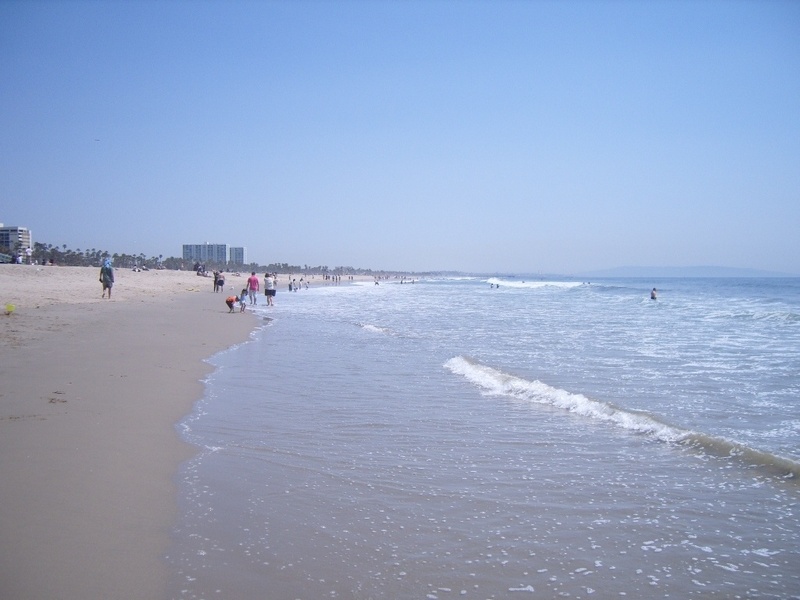 We decided to stay another day here at Malibu Beach RV Park. We’d had a very busy day yesterday and were not keen to be back on the road again. As we quite liked the look of Santa Monica when we passed through yesterday we thought we’d take a closer look. We caught the bus again and paid our $10 for two all day passes though we had no intention of going anything like as far with them today. 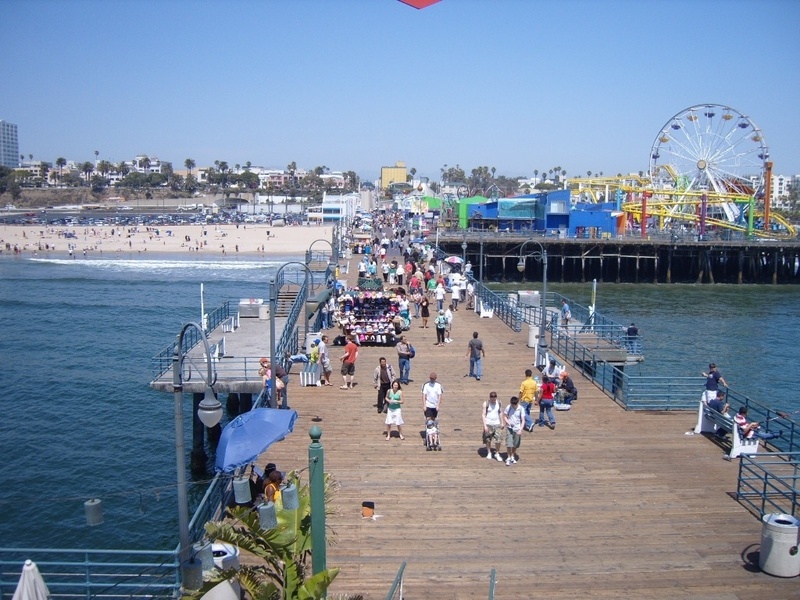 On arrival at Santa Monica’s beach we sat near the pier on the lovely warm, clean, huge, sandy beach and ate our lunch. That lightened the load in our backpacks which was helpful, as we then had a stroll along the pier which has the world’s first solar powered Ferris Wheel and an indoor old fashioned carousel which was featured in the film ‘The Sting’, then it was off in to town. Third Street, which runs parallel with the beach was very nice indeed, and better still, was vehicle-free, providing a lovely continental atmosphere. We decided we wouldn’t leave it too late before making our way back as we wanted to try and stop off at the Malibu shopping mall on the way through, and the buses are rather infrequent after late afternoon. In attempting to do so we got off the bus too soon and ended up in a chic, fashionable (a term meaning expensive), shopping complex. We waited for an hour in the heat for the next bus which wasn’t much fun, before deciding against trying to stop off further down the road for our shopping and instead made our way back to the RV. After jumping on the bus and getting settled in to the front centre facing seat I looked directly across and who was sat there – ‘Catwoman of Malibu’ fast asleep with the scruffy cat on her lap. I suppose I could have woken her and told her she’d missed her stop but it seemed a shame to spoil the cat's peace and quiet. Back home we had our chicken curry alfresco, followed by a drink whilst staring out at the Pacific Ocean. Tomorrow we move inland and this will be the last time we will see the Pacific. The alarm clock went off at 06:00 and we were up, out, and in the shower block pretty smartly, and what an excellent shower block it is too. There are really powerful showers with lots of hot water. The Chef had defrosted a chicken breast in the fridge overnight ready to include in the chicken curry to be cooked in the slow cooker for tonight’s meal. The amount of water the chicken had around it in the cling-film-covered dish suggested it had not been killed quickly and humanely but had in fact drowned. We caught the Metro 534 bus www.mta.net about a ¼ mile from the campground on Hwy1. We paid $5 each for an all-day pass. The bus driver and fellow passengers were very helpful and put us right about our route. Down the road a few stops we picked up ‘Catwoman of Malibu’. She stepped on with a scruffy cat sat on her shoulder and then proceeded to talk none stop to the driver and young passenger opposite her, neither of whom took any notice. She had 'issues' bless her. 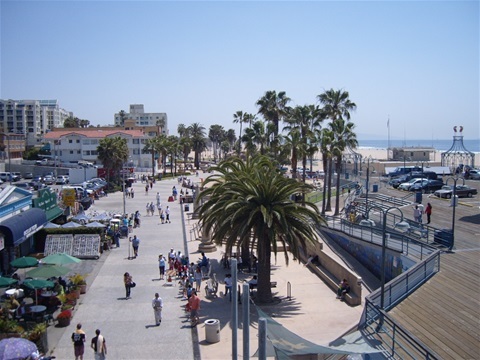 The bus took us past Santa Monica beach and pier and after about an hour dropped us at the junction of Fairfax & Venice in the suburbs of Los Angeles. From there we caught our second bus, the 217 which dropped us right outside Mann's Chinese Theatre on Hollywood Boulevard. We took a few photographs of the Walk of Fame and after that wondered what to do with ourselves. We were approached by an elderly female who was trying to sell us the all singing all dancing tour to the ‘Hollywood’ sign up in the hills and a drive past rich and famous people’s houses. I told her I wasn’t the slightest bit interested in where rich and famous people lived, but we did decide instead to take the one hour open top bus tour past the ‘Hollywood’ sign but leaving the rich and famous in peace, departing just down the road from the theatre. We paid $32 for two tickets and made our way to the bus for our 10am trip. After a short walk we arrived at the bus with just five minutes to spare to be told that since we were the only two passengers they would not be leaving at 10am, maybe at 10:15, or maybe at 10:30. Rosina asked “What if we are still the only two passengers at 10:30?” The guys there didn’t have an answer, and so we told them we wanted our money back, they said to go back to the office. The Chef noticed that the ticket did say quite clearly that there were no cash refunds. When we got back to their office our ‘geriatric hustler’ told us we were going the wrong way for the bus and we told her that it wasn’t leaving at ten o’clock. She tried giving us some soft soap and so I told her straight, “The ticket has ten o’clock on it, we’ve paid our money, we have entered in to a contract and you are now in breach of that contract”. She wasn’t too impressed, bang goes her commission, and told us to speak to the chap behind the desk. He told us he was the manager and we would definitely be travelling at 10 o’clock even if we were the only two people onboard. I told him that he’d better get down the road and sort his staff out then as they weren’t going to move with just two people onboard. He gave us our money back and we left. By now we had confirmed our suspicions – we wouldn’t like Los Angeles. 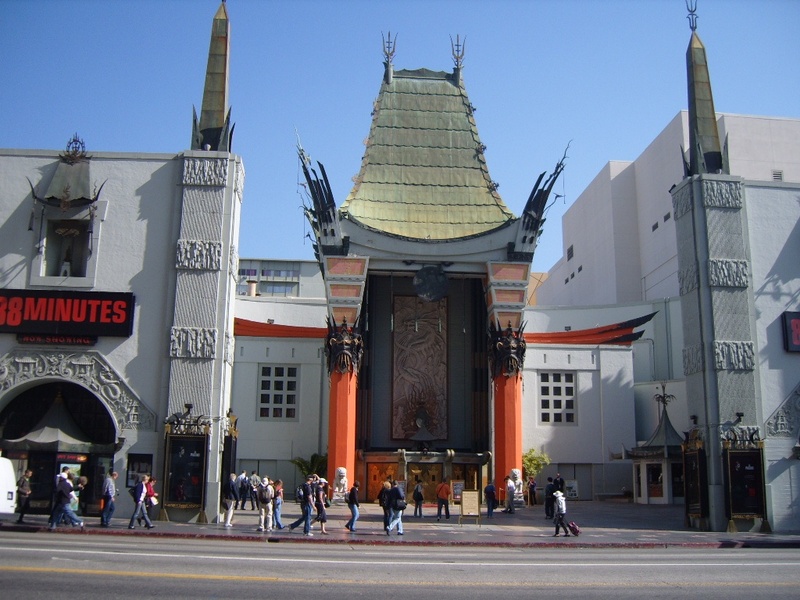 We walked next door to the Kodak Theatre and through the centre of it could see the ‘Hollywood’ sign on a distant hill behind. So up the stairs and escalators we went and took our photographs of the sign from there. What a saving in time, effort and money. That was it, we’d done all we wanted to do in this rip-off tourist nightmare, and it was still only 10:30. We decided to try and get to Long Beach to see the Queen Mary www.queenmary.com something we had planned to do tomorrow. To our pleasant surprise our $5 passes which we’d purchased back at Malibu Beach entitled us to travel on the Metro, trains and trams as well as the buses. We needed to take one underground train from right there at the Kodak Theatre and then change to another which was a combined underground metro, and over-ground tram & train which took us all the way to Long Beach where, after a quick pizza lunch, a short free bus ride delivered us to the Queen Mary’s berth. It had been forty years since I had last seen her. It was the 31st October 1967, I was in the Royal Navy and it was my first ever day at sea onboard the aircraft carrier HMS Hermes. We had left Portsmouth, sailing to support our troop withdrawal from Aden. At the same time the Queen Mary left Southampton for the very last time on her last cruise and scheduled to end her cruise right here. HMS Hermes escorted her down the English Channel before she went her way and we went ours. She was smaller than I remembered her. Completed in 1937 she represents an era of style and elegance, sadly gone and never to return. The tour around her was very interesting and well worth our joint entrance fee of $43.90 (senior’s ticket price – sometimes it pays to get old). The engine rooms were as quiet as the grave; we were the only people down there. It was hard to believe that all those years ago this would have been a very hot, noisy and busy place to be, the heart of a living, steaming, growling beast. After completing our look over her we bought a coffee and cake during which I managed to spill my remaining coffee over a clean pair of trousers leaving me wondering which of us had fared the best since we last met, and I had to conclude that we were both a bit rusty and flaky after so long but at least they can rub her down, give her fresh coats of paint and replace worn out bits, which is more than can be said for me. Our target time for leaving Long Beach was 15:00 as we had a long journey back involving three buses and two trains. When we left we hit the rush hour; traffic jams galore and noisy individuals who just had to make loud mobile phone calls about absolutely nothing, apart that is from the young lady who was obviously being dumped by her boyfriend by phone, all rather embarrassing in a public place. It seems the smaller the phones become, the bigger the mouth that's needed to operate them. We arrived back at the RV at about 19:00, having been out for almost 12 hours. It had been a long hard day, but we had achieved so much and now find ourselves even further ahead of our planned schedule. We were looking forward to our chicken curry dinner, cooked in the slow cooker whilst we were out. When we opened the RV door, there was no welcoming curry smell to greet us. Unfortunately we’d turned the timer on but not the slow cooker itself. Luckily there’s a ‘chippy’ down the road. The only retail outlet for about 2 miles. It’s a seafood restaurant and take-away which is very popular with the locals. I don’t do seafood as I’ve yet to be convinced that eating something that has spent its life swimming around in radioactive, chemically polluted water is healthy eating, and so I had chicken strips and fries, Rosina had the salmon, and why not, after such a hard day she’d earned it. Whilst in there waiting for our food I earned the gratitude of the poor live lobsters who, realising I wasn’t looking to have any of them for dinner could relax for a while. Before we leave Malibu I might just pop in to the Fire House and tell the fire truck driver that you can indeed get to LA by bus, it’s easy and it’s safe, at that time of day anyway, and if he ever feels brave enough, he should try it himself. Guess what we’ve got for dinner tomorrow?